The basic gas producing reaction in the digester is: carbon plus water = methane plus carbon dioxide (2C + 2H2O = CH4 + CO2). The methane has a specific gravity of 0.55 in relation to air. In other words, it is about half the weight of air and so rises when released to the atmosphere. Carbon dioxide is more than twice the weight of air, so the resultant combination of gases, or simply bio-gas, when released to atmosphere, will rise slowly and dissipate. As a general rule, pure methane gas has a heat value of about 1,000 British Thermal Units (BTU) per cubic foot (ft3). One BTU is the amount of heat required to raise one pound (one pint) of water by 1°F (0.56°C). Five ft3, or 5000 BTU of gas, is enough to bring 1/2-gallon of water to the boil and keep it there for 20 minutes. If you have a volume of bio-gas which is 60% methane, it will have a fuel value of about 600 BTU/ft3, etc. The fuel value of bio-gas is directly proportional to the amount of methane it contains (the more methane, the more combustible the bio-gas). This is because the gases, other than methane, are either non-combustible, or occur in quantities so small that they are insignificant. Since tables of "Fuel Values of Bio-Gas" may not show how much combustible methane is in the gas, different tables show a wide variety of fuel values for the same kind of gas, depending on the amount of methane in the gas of each individual table. The temperature at which digestion takes place. This has already been discussed. The nature of the raw material. According to Ram Bux Singh (Ref. 2): "pound for pound, vegetable waste results in the production of 7 times more gas than animal waste." In our experience, pressed plant fluids from succulent plants (cactus), greatly increases the amount of gas produced, but certainly not by a factor of 7. Harold Bate (the chicken manure car) has noted that more gas is produced from manure with a little straw added. But, we are more interested in the production of methane than bio-gas. Laboratory experiments (Ref. 40, 41) have shown that plant materials produce bio-gas with a high proportion of carbon dioxide. So, the extra gas produced by plants may be less valuable for our purposes of fuel production. With good temperature and raw materials, 50 to 70% of the raw materials fed into the digester will be converted to bio-gas. Other values for gas production are from working digester operations. These are shown as cubic feet of gas produced by the Total Solids and are more liberal values than in Table 9. As an example, suppose we had 100 chickens which were allowed to forage during the day, but were cooped at night, so that only about half of their manure was collectable. At 0.1 lb/chicken/day this would amount to about 10 lbs of wet or 3.5 lbs dry (Table 4) manure per day. Other conditions being equal, this could be equivalent to about 20-40 ft3 of bio-gas (assuming 60% methane) 12-24 ft3 of methane gas per day. Digesters can be designed for batch-feeding or for continuous feeding. With batch digesters a full charge of raw material is placed into the digester which is then sealed off and left to ferment as long as gas is produced. When gas production has ceased, the digester is emptied and refilled with a new batch of raw materials. Batch digesters have advantages where the availability of raw materials is sporadic or limited to coarse plant wastes (which contain undigestible materials that can be conveniently removed when batch digesters are reloaded). Also, batch digesters require little daily attention. Batch digesters have disadvantages, however, in that a great deal of energy is required to empty and load them; also gas and sludge production tend to be quite sporadic. You can get around this problem by constructing multiple batch digesters connected to the same gas storage. In this way individual digesters can be refilled in staggered sequence to ensure a relatively constant supply of gas. Most early digesters were of the batch type. With continuous-load digesters, a small quantity of raw material is added to the digester every day or so. In this way the rate of production of both gas and sludge is more or less continuous and reliable. Continuous-load digesters are especially efficient when raw materials consist of a regular supply of easily digestible wastes from nearby sources such as livestock manures, seaweed, river or lake flotsam or algae from production sludge-ponds. The first continuous-load digester seems to have been built in India by Patel in 1950 (Ref. 43). Continuous-feeding digesters can be of two basic designs: vertical-mixing or displacement (Fig. 13). Vertical-mixing digesters consist of vertical chambers into which raw materials are added. The slurry rises through the digester and overflows at the top. In single-chamber designs the digested or "spent" slurry can be withdrawn directly from effluent pipes. In double-chamber designs the spent slurry, as it overflows the top, flows into a second chamber where digestion continues to a greater degree of completion. Displacement digesters consist of a long cylinder lying parallel to the ground (e.g., inner tubes, oil drums welded end on end, tank cars, etc.). As it is digested the slurry is gradually displaced toward the opposite end, passing a point of maximum fermentation on the way. In vertical-mixing digesters raw material is subject to a vertical pumping motion and often escapes the localized action of digesting bacteria. Slurry introduced at one time can easily be withdrawn soon afterwards as incompletely digested material. 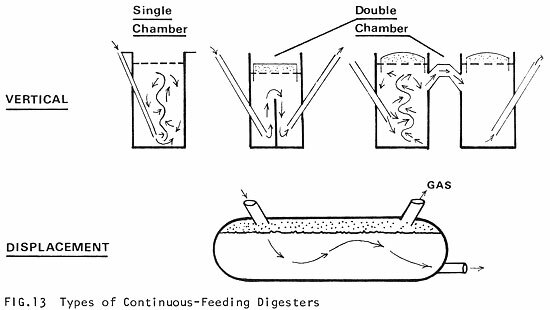 In displacement digesters slurry must pass an area of maximum fermentation activity so that all raw materials are effectively digested (much like the intestines of an animal). From a practical point of view, displacement digesters are easier to operate. If digester contents begin to sour for one reason or another, strongly buffered material at the far end can be recirculated efficiently by simply reversing the flow of material along the line of the cylinder. In addition, raw materials can be digested to any desired degree without the need for constructing additional chambers or digesters. The problem of scum accumulation is reduced in displacement digesters. Since scum forms evenly on the surface of the digesting slurry, the larger the surface area, the longer it takes to accumulate to the point where it inhibits digestion. A prone cylinder has a larger surface area than an upright one. Any continuous-load digester will eventually accumulate enough scum and undigested solid particles so that it will have to be cleaned. The periodical washing out of displacement digesters is considerably easier than vertical-mixing digesters. 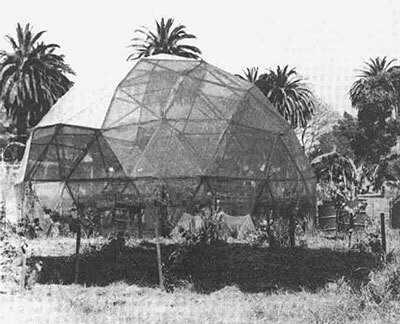 The first large-scale displacement digester was designed and built by L. John Fry during the late 1950's on his pig farm in South Africa (Ref. 42, 44). Mr. Fry, now a resident of Santa Barbara, is acting consultant for the New Alchemy digester project which is currently focusing attention on the design and utilization of small-scale displacement digesters. Plant Wastes: The primary advantage to plant wastes is their availability. Their disadvantage for a small farm operation is that plant wastes can often be put to better use as livestock feed or compost. Also, plants tend to be bulky and to accumulate lignin and other indigestible materials that must be regularly removed from digesters. This severely limits the use of plant wastes in continuous-feeding digesters. Press plant fluids out of succulent plants (e.g., cacti, iceplant, etc.) and digest juices directly, or use them as a diluter for swill. Digest plants not containing lignin (e.g., seaweed). Animal Manures: The main advantage to animal manure, with respect to continuous digesters, is that it is easy to collect (with proper design of livestock shelters) and easy to mix as slurry and load into digesters. Successful continuous digesters have been set up using pig manure (Ref. 26, 42, 44), cow dung (Ref. 3, 5, 6) and chicken manure (Ref. 17). The general consensus seems to be that, among animal manures, chicken manure "is easily digested, produces large quantities of gas and makes a fertilizer very high in nitrogen (Ref. 4, 5). Human Waste: Human waste or "night soil" has long been used as a fertilizer, especially in the Orient (Ref. 46, 47). However, there seems to be little information on using human wastes as raw materials for anaerobic digesters. A few ideas involving outhouses and latrines are described by Gotaas (Ref. 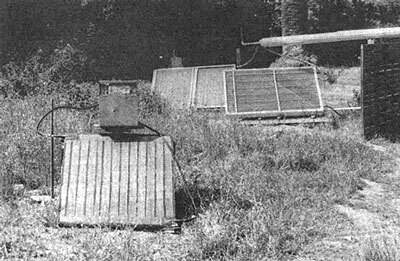 15) in his chapter, Manure and Night Soil Digesters for Methane Recovery on Farms and in Villages. It seems possible, also, that digesters could be incorporated into aerobic dry toilet designs of the "Clivus" type (Ref. 48). This may be especially fruitful since the main drawback to using human wastes from flush toilets is the excess water that is carried with it which inhibits digestion. A well-designed privy digester which paid special attention to the transmission of diseases peculiar to humans would be a real asset to homestead technology. A solution to this problem would be welcomed. One suggestion is a seat with a clip-on plastic bag. When filled it could be dropped into a digester intact. The plastic would have to be a material which would decompose only in the presence of methane bacteria, or liquids generally after so many hours. In calculating the size of a continuous-load digester the most important factors are loading rate and detention time. Loading Rate: Is defined as the amount of raw material (usually pounds of volatile solids) fed to the digester per day per ft3 of digester space. Most municipal sewage plants operate at a loading rate of 0.06-0.15 lb VS/day/ft3. With good conditions, much higher rates are possible (up to 0.4 lbs VS/day/ft3). Again, as with most aspects of digesters, the optimum situation is a compromise. If you load too much raw material into the digester at a time, acids will accumulate and fermentation will stop. The main advantage to a higher loading rate is that by stuffing a lot into a little space, the size (and therefore cost) of the digester can be reduced. Suppose you had 10 lbs of fresh chicken manure (total manure from about 30 chickens) available for digestion every day: 10 lbs fresh chicken manure = 2.3 volatile solids (Table 4). At a loading rate of 0.2 lbs VS/day/ft3 this would require a digester 2.3/0.2 = 12 ft3 in volume (about the size of two 50-gallon drums). At a loading rate of 0.1 lb VS/day/ft3, this would double the necessary size of the digester with the same amount of manure. Detention Time: Is the number of days that a given mass of raw material remains in a digester. Since it is very difficult to load straight manure into a digester it is usually necessary to dilute it with water into a slurry. If too much water is added, the mixture will become physically unstable and settle quickly into separate layers within the digester, thus inhibiting good fermentation. The general rule-of-thumb is a slurry about the consistency of cream. The important point here is that as you dilute the raw material you reduce its detention time. The volume of 10 lbs of fresh chicken manure is about 0.2 ft3. If this is diluted 1:1 with water the volume becomes about 0.4 ft3. With the 12 ft3 digester described above, this would mean a detention period of 0.4/12 = 36 days. If the manure were diluted more, say 2:1, the volume would be 0.6 ft3 and the detention period would be reduced to 0.6/12 = 20 days. Up to a point, then (usually no less than 6% solids), diluting raw materials will produce the same amount of gas in a shorter period of time. These relationships between loading rate, detention time and digester size reveal themselves more clearly after direct experience with continuous-load digesters. However, generalities can be of some use in the beginning. For the most efficient operation, especially in temperate climates, digesters should be supplied with an external supply of heat to keep them around 95°F (35°C); there are several ways to do this. Methods which heat the outside of digesters (e.g., compost piles, light bulbs, and water jackets) could be more effectively used as insulation since much of their heat dissipates to the surroundings. (Since digesters should be constantly warmed rather than sporadically heated, compost "blankets" are not very practical unless you coordinate a regular program of composting with digestion.) Similarly, green houses built over digesters tend to overheat the digester during the day and cool it down at night. The most effective method of keeping digesters warm is to circulate heated water through pipes or coils placed within the digester. The water can be heated by solar collectors or by water boilers heated with methane. Gas-heated water boilers are a good idea since they allow the digestion process to feed back on itself, thus increasing efficiency. One practical gas-heater design we have used is shown in Fig. 5. The thermostat in the water boiler is set at 140°F (60°C) because slurry will cake on surfaces (e.g., the water coils) warmer than this. The digester thermostat is set at the optimum 95°F (35°C). Until the digester begins producing methane, propane can be used as a fuel source for the water boiler. For optimum heat exchange within the digester, a ratio of 1 ft2 coil area per 100 ft3 of digester volume is recommended (Ref. 8). A word of caution if you insulate your digester. Methane is not only combustible but highly explosive when it makes up more than 9% of the surrounding air in confined spaces. If you use synthetic insulation, avoid porous materials such as spun glass which can trap gas mixtures. It's easy to scrounge styrofoam sheets since they are so commonly used as packing material and regularly discarded. Styrofoam is one of the best insulating materials, although it is slightly flammable.